The eerie calm surrounding Bitcoin (CURRENCY:BTC) near the lows is ominous. Despite an abundance of news which previously would have moved markets, the patriarchal cryptocurrency is barely budging. We wonder whether investors are waiting for the next big move to play out, petrified of staking a position before possible bearish convergence sends prices crashing lower. 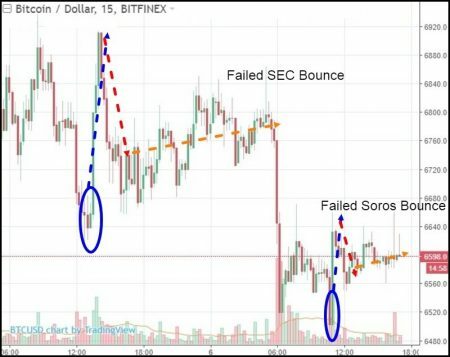 Exemplifying just how much confidence bulls lack presently, ZeroHedge published a story this morning titled Soros To Start Trading Cryptocurrencies Amid Plunging Prices that failed to move the needle. Apparently, lead Soros Fund Management portfolio manager Adam Fisher has received approval to trade virtual coins within the last few months. The piece further stipulates that Fisher “has yet to make a wager”, suggesting that massive sideline money lay-in-waiting to snap up depressed crypto assets. Soros Fund Management has several billion dollars of assets under management—mostly in equities. This comes on the heels of bullish commentary by Security and Exchange Commission (SEC) Chairman Jay Clayton, who yesterday rejected the idea that all ICOs are fraudulent. Technically speaking, bitcoin is completely broken. It’s trading below every moving average imaginable, and hovers precariously close to the $6000/BTC level marking the February capitulation lows. If this price gets taken out, next (minor) support is around the $4900/BTC mark. Some believe BTC’s ultimate stop could be the $3,100 level; an area marking bitcoin’s massive August 2017 breakout and subsequent September re-test lows. Until this dark overhang clears, predicting the market is an exceedingly difficult thing to do. Prices will be subject to the whims of an extraordinary volatile news cycle. And right now, that mostly points down… Waiting for further sector visibility doesn’t seem like such a bad idea. Bitcoin was trading over $9000/BTC at the time. With positive news being discounted so easily of late, nothing has really changed to move the needle on that opinion. In my opinion, the volatility charts confirm that BTC remains in a danger zone. While volatility can skyrocket upwards during price increases (as the chart clearly shows), what are the odds of it happening with bitcoin in technical disarray and unresponsive to bullish catalysts? Furthermore, BTC is at the point where outsized volatility moves tend to occur. Historically speaking, that’s about every 4-5 months or so. With bitcoin’s previous volatility trough occurring in late October 2017, a volatility spike should be expected. Given the current state of the market, does a large spike in volatility favor sizable upside or downside price expansion? The answer, dear friends, is rhetorical. There’s a good reason why the Midas Letter hasn’t been weighing-in on bitcoin lately. Sure, sentiment has been rock-bottom and the volatility drainage has been less conducive to story telling. But the real reason is that the market remains very difficult to predict. For every positive development pointing to mainstream crypto adoption, there’s two stories about how some international government is trying to ban it. Add the conflicting evidence regarding BTC’s (and crypto in general) utility as a consumer payment conduit, and the waters get ever more muddied. In a sense, there’s less clarity now about bitcoin’s role true role in the real economy than ascribed 12 months ago. None of these musings should be construed as an endorsement to (short) sell BTC. As famous economist Nassim Taleb said last year, “There is NO way to properly short the bitcoin “bubble.” With only about 16.85 million BTC in circulation (not including ‘lost’ coins, numbering in the 000,000’s), the market is too illiquid to stake a big bet. One wrong move can lead to financial catastrophe, and I believe both bulls and bears are waiting for the other side to flinch first. Now that George Soros has entered the fray, bulls should be even more cautious. As the man who broke the Bank of England of England (sterling pound) in 1992 and Bank of Thailand in 1997 (Thai baht), Soros consortiums have a history of currency crisis involvement. Whether Soros-based funds are long, short, neutral— or simply using the media to misdirect is unknown. But given the ugly technicals, lack of ‘true’ capitulation selling and Soros murky involvement, I’ll gladly wait on the sidelines for now. For the average investor, I can’t fathom there being any other way.